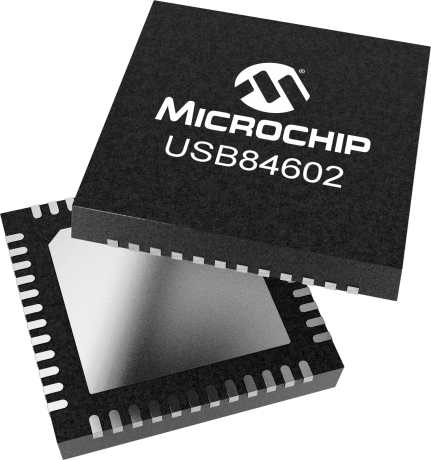 The Microchip USB84602 is a low-power, OEM configurable, MTT (Multi-Transaction Translator) USB 2.0 hub controller with 2 downstream ports and advanced features for embedded USB applications. The USB84602 is compliant with the USB 2.0 Specification and has passed AEC-Q100 testing. It includes advanced USB features, like; USB 2.0 Link Power Management and High-Speed Inter-Chip (HSIC) USB Electrical Specification Revision 1.0 for low power consumption. The USB84602 will attach to an upstream port as a Full-Speed hub or as a Full-/Hi-Speed hub, while the 2 downstreams ports support Low-Speed, Full-Speed, and Hi-Speed (if operating as a Hi-Speed hub). The HSIC interface is available as an updsteram port option, and provides support Hi-Speed operation, only. Meeting the desire of consumers for a “connected vehicle,” Microchip’s FlexConnect technology allows for easy port reversals or “role swapping.” The USB84602’s downstream port 1 is able to swap with the upstream host port, thus transferring the host capability to the product connected to port1, such as smartphones and tablets. This unique capability allows for the smartphone ecosystem of software and applications to be connected to the automobile infotainment system. The USB84602 provides for a part type option to enable an USB endpoint dedicated for use as a USB to I2C/SPI interface, thus allowing external circuits or devices to be monitored, controlled, or configured via the USB interface. The USBF129 flash memory device is also offered as a companion chip to the USB84602. It is factory pre-programmed with application firmware and default hub configuration settings. The USBF129 memory function assures proper functionality, providing for decreased development time and engineering resource, and overall faster time to market.